WOW, there's a lot of detail in the drawings. Every time I look at them I find something new I didn't notice the first time. Most of this month has been spent studying the plans and reading the manual. There is so much information to absorb. I've also been to have a look at Mike Hajukiewicz's Cricri to get a feel for the project. Mike has completed the tail plane, rudder and flaps. His wing is ready for the skin. It is a most impressive structure. Harry Leek also let me view his Cricri. Harry's was bought complete and he is doing a little fetterling to it ready for the flying season. I've also been trying to find the aluminum extrusions to start the tail plane, which is proving a little difficult. It seems the whole world measures in imperial apart from the French. Suppliers like Aircraft Spruce require the extrusion thickness in fractions. The plans are now going back in their postal tube until Easter Monday. I'm off to Cyprus for two weeks to teach the Army how to glide. Work has been keeping me pretty busy this month so not much progress on my Cricri. Most of my evenings have been spent trawling the Internet trying to find the elusive 2024 T4 10x10x1.2 extrusion to start the spar caps for the elevator. I must have emailed about 30 different Aluminum companies, with about 12 replying back, all with the same answer, "Sorry sir, we do not stock that item". I think I will have to take up Victor's suggestion and buy over size and cut it down to size. What I have managed to do is to start to make the template for the aerofoil section of the elevator. I found some scrap 4mm thick Ali at work and I'm going to use that as the template. I've also bought a TCT router cutter 'Flush trim bit with bearing' to cut out the conticell. The router bit is designed to trim the edge of the Formica laminate on kitchen worktops. I'II keep you posted on how well it works. The 2024 angle saga continues. I thought I would try manufacturers who produce dies to extrude aluminum. My luck was in, there is a company about 40 miles north of where I live so I gave them a call. They had 25m of 10x10x1.2, yippee I thought, that was until I mentioned specifications. It turned out to be double-glazing company, Doh. I think I can quite confidently state that there is a worlds shortage of 2024 T4 10x10x1.2 angle. So, an email to Aircraft Spruce and a few credit card details and 10ft of 16x16x1.6 found its way to the UK. Having studied the plans in greater detail, I see Michel Colomban actually gives the spar cap co-ordinates for 1.6mm angle. One really has to study the plans over and over again as I had mist this bit of information. I noticed that the 1.6mm co-ordinated actually taper into the 'H' part of the spar cap and form a chisel shape to the tip of the spar cap. This I find a strange engineering technique so I am questioning this with the Popular Flying Association (PFA) engineers before I start cutting. I've also got the foam for forming the tail plane. I contacted the DIAB Group www.diabgroup.com in the UK and spoke to Frank McCauley frank.mccauley@diabltd.co.uk , the Commercial Manager, who was very helpful. He sorted out some 6mm Divinycell 80 for me. I'm a bit late publishing June's diary so I have combined it with July's. Unfortunately work has been interfering with my building. The PFA have been in touch and Francis Donaldson, the chief engineer, agrees the tapering of the spar caps into the 'H' section sounds a bit bizarre so he said just take the spar cap co-ordinates down to 1.6mm. I've made one. Very fiddly indeed. I used a jigsaw to take the excess aluminum off and that was mistake. The weight of the jigsaw put a slight banana shape in the spar cap, which I had to ease back into shape. 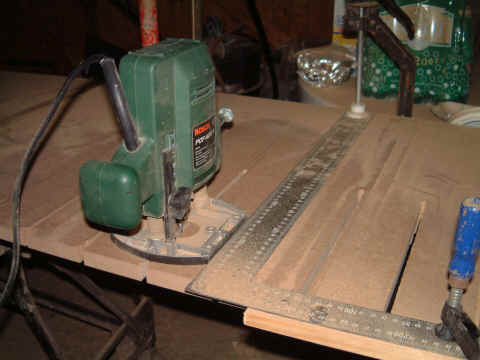 I'm now currently looking for a band saw, which should eliminate to problem in future. To get the finial shape I used a Linisher with belt sander. I was amazed at the accuracy that can be achieved using this machine and I highly recommend the use of one. Then finishing off was with scotch bright. The big problem with the spar cap was handling it without ripping your hands to shred's. It is very flimsy. 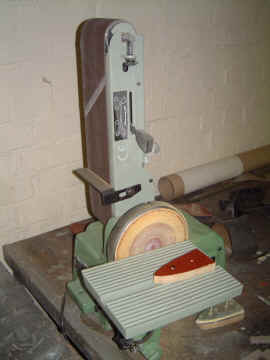 Again, cutting it roughly to shape with a guillotine, then finishing off with the Linisher and scotch bright. There were a few scratches in the spar cap that had to be dressed out and again I used scotch bright. Next time I will make sure the Aluminum sheet comes with a protective covering on it. 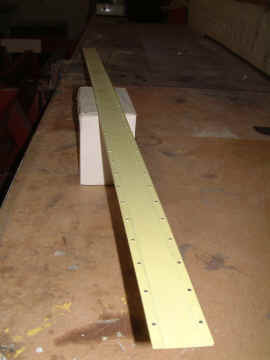 I've found a company in the UK that produces the 4mm thick Tee section for the tail plane, £48 per meter with a minimum order of a 6m length (£288). I've pleaded with them to sell me a 1m length but they won't. I've even told them Cricri builders will buy the rest, but no, they won't sell me a 1m length. Tonight they have said they will sell me a 1m length, but have a minimum order of £225 + £25 P+P. Needless to say, I'm still looking for the Tee section. 3 weeks family holiday to the land of the Cricri (France) has slowed down my building a little. Solved my lack of band saw problem. I've lent my friends. Perhaps it wasn't the weight of the jigsaw that caused the problem with the bending of the spar cap. After using a band saw to cut one side to width and tapered the other side I end up with what could be best discribed as a compound curve in my spar cap. An email to Victor Asp and he said it was quit normal, as I had released stresses created during the extrusion process. Bend it back into shape he said. Easier said than done. I think if I had spent as much time building as I have spent finding Tee section extrusion I would have had my tail plane finished by now. Victor Asp suggested I purchase some aluminium bar and mill it to the correct dimensions. However, my inspector wanted me to get approval from the Popular Flying Association (PFA-The UK home built governing body www.pfa.org) due to it being such a highly stressed component. The PFA did not want to approve the milling and asked me to contact the designer, Michael Colomban. Within a week Michael got back to me. Comprehensive letter explaining to forces involved and approving the milling of the tail plane pivots and push rod fitting. Out of interest, the pivots only need to be 0.5mm thick to achieve the required strength and are 4mm thick to facilitate the fitting of the spherical bearing. Talking of bearings, ADR no longer exists. They were bought out by SKF and Michael approves of SKF as long as they are of the same specification. Double sided sticky tape, an absolute must. I have found no other way of holding the spar caps securely enough to work them. They are finished now and I am just waiting for my inspector to have a look at them to make sure I have reached the required standard. I am after all just a humble aircraft gas turbine technician and not an airframe technician. Due to the fact that I am using 1.6mm spar caps, there is insufficient room to screw through the spar cap onto the spar web for bonding. What I have come up with is a kind of clamp affair. With the spar cap resting along a length of MDF (the edge radiused) the web is then placed on top. 2.4mm counter sunk pop rivets which have the mandrel cut in half are then pushed through the cap and web into the MDF. The mandrel just happens to be 2.0mm diameter. This leaves the counter sunk 'grip' part of the rivet pressing where the head of the screw would be. 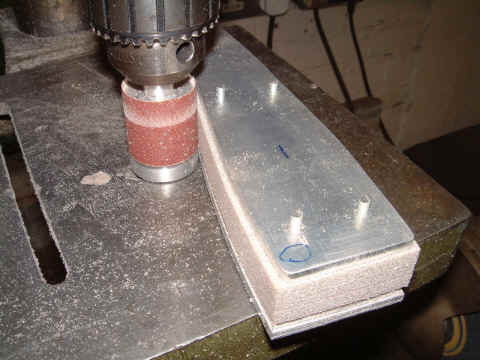 With another piece of MDF having 4.00mm holes drilled in which exactly match the rivet holes in the spar, this is placed over the rivets and the MDF pushes down on the counter sunk 'flange' part of the rivet. I hope to include a picture diary if my friend loans me his digital camera and photograph various stages of the build. The 'glue' I have chosen is Cibe Araldite 2011 as recommended to me by another UK builder. I need to do some tests to satisfy my inspector and myself that the 2011 will bond satisfactory to bare aluminium, epoxy primer and zinc chromate primer. The epoxy primer I intend to use is PR143 as used on airline and military aircraft. One finger typing time, got knocked off my motorbike yesterday and broke my hand. Anyway on with my project. The spar caps are bonded to the spar web. Very messy business. I used box tape to protect the spar where I didn't want the glue to run. However, all that happened was that the glue bonded it's self to the box tape and the spar. It took many hours of careful rubbing and scraping to remove the glue and brown tape. My friend Gary Binnie, an airframe technician with structures bay experience helped me to rivet the spar. We achieved this by putting the riveting dolly in a vice and then two light taps with a punch and hammer on the rivet tail 'nailed it home' as Gary would say. The spar is now primed. See picture. The Divinicell ribs are now cut. My friend 'Foxy' made me a fantastic tool for making them. The diameter of the barrel was made 0.5mm less than the bearing to facilitate the thickness of the 80 grit and double sided tape, so the whole tool was parallel. 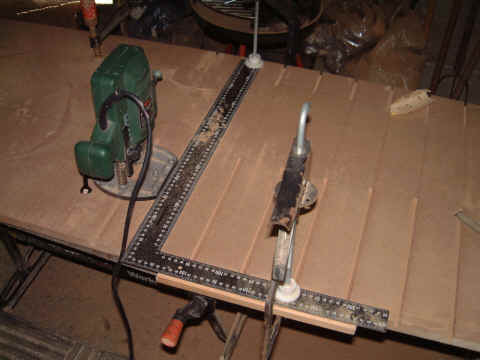 The tool was then just put in a pillar drill and run round the tail plane jig. 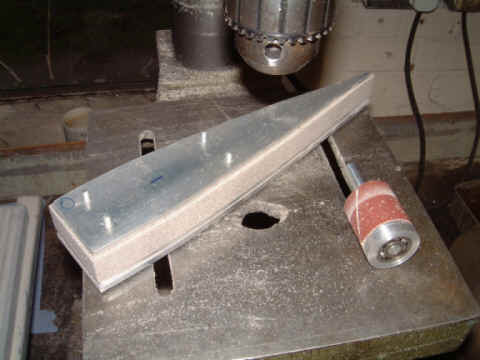 The 4mm 'T' section is impossible to find so I bought 1" by 1 1/4" x 2 feet rectangular section from Aircraft-Spruce and got a local machine shop to produce the tailplane pivot fittings. I'm now waiting for the SKF spherical bearings to arrive and they will be ready to fit to the spar.